If you‘re thinking about converting your traditional IRA to a Roth IRA, this calculator can help. When you enter your information, you’ll receive a hypothetical comparison of future IRA balances, both Roth and traditional, that can help you decide whether converting makes sense. You’ll also get an estimate of the federal income tax you’d owe for the conversion. Enter your blog address above to check your server status, RSS feed, markup, security, and performance. The purpose of the Hymn Project is to allow you to exercise your fair‐use rights under copyright law. The various software provided on this web site allows you to free your iTunes Music Store purchases (protected AAC / .m4p) from their DRM restrictions with no loss of sound quality. These songs can then be played outside of the iTunes environment, even on operating systems not supported by iTunes and on hardware not supported by Apple. Richmond in East Central Indiana. This year, ride with 350 other cyclists on a grand heritage loop through southeastern Pennsylvania and the Delaware River Valley of New Jersey, July 17–24. We admit that we are fortunate that our four‐year‐old is a good eater. But we are convinced that this is due in part to the fact that we involve him in our food. He helps in the garden, he flirts with the ladies at the farmers’ market, he sometimes gets the honor of choosing a menu at home, or even which restaurant we visit. 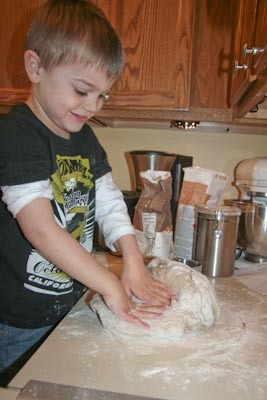 But for a while now, he has been old enough to be a helper in the kitchen. Since last summer, we have made many loaves of bread together. We both get a kick out of this simple thing, and we all get to share some pride and enjoy what we have made. Our favorite recipe lately has been the wheat bread from a cookbook put together by one of the owners of Sonlight Camp in the beautiful mountains of Colorado. With guidance from David’s grandma, we have made a couple small changes that seem to help in our low midwestern elevation. Combine 3 cups of whole wheat flour, salt, and yeast in a large bowl. In a sauce pan over low heat, combine milk, honey, and oil. Heat until warm. Pour over flour mixture and blend well. Add egg and blend well. Add 1 cup wheat flour, then gradually work in 4 to 4½ cups of white flour. Knead dough on a lightly floured surface for about 5 minutes. Place in a greased bowl, cover with a damp cloth and let rise for about 45 minutes or until doubled in bulk. Punch dough down, and divide in thirds. Shape each third into a loaf by rolling into rectangles. Place in greased bread pans, cover, and let rise until doubled. Put in a cold oven, set at 400°, and bake for 10 minutes. Reduce heat to 375° and bake an additional 30 minutes or until loaves are golden brown. Immediately upon removing loaves from oven, brush tops with melted margarine. Makes 3 loaves. A Year of Slow Cooking: You Can Make Yogurt in Your CrockPot!